It sounds pretty awful doesn’t it? 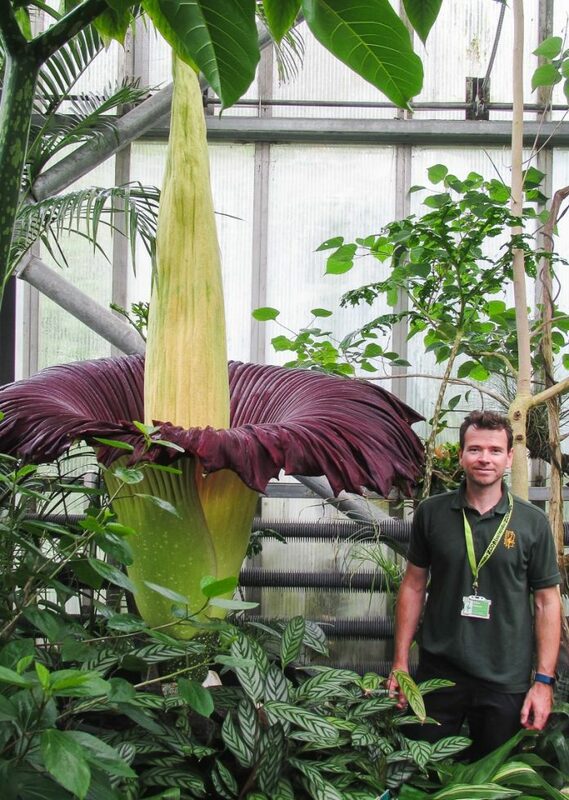 A big smelly flower, but the new flower requires a name and the gardeners at Paignton Zoo are struggling to find one. A Titan arum plant was about to bloom, and it was in need of a name. So the gardeners at Paignton Zoo turned to social media and asked the public. Titan arum or Amorphophallus titanum, to give the flower its Latin name, can bloom up to 3 meters high and 3 meters in circumference and smells like rotting meat. In 2012, Paignton Zoo made the headlines as it was the first zoological collection in the UK to have a Titan arum bloom. The gardens team succeeded again in 2015 and saw two more bloom in 2017. Paignton Zoo’s garden team were able to pollinate one of these, and shared seeds with other zoos and botanical gardens. Our fifth Titan arum bloom is in Crocodile Swamp opposite one of the pools. When you stand looking at the plant, a crocodile creeps up behind you, which is a little unnerving! The Titan arum has flowered before, in 2015, and took the gardens team by surprise this year. This is our first autumn bloom. We thought it was going to be a leaf – then it turned into a flower! At 235cm tall, it is now officially Paignton Zoo’s tallest ever Titan bud. Members of the public were able to vote on the Paignton Zoo’s official Facebook page, choosing between Audrey II (from the stage musical and film Little Shop of Horrors); Kronos (a Titan from Greek mythology) and StarFire – from the TV show Teen Titans. Other Paignton Zoo Titans have already been named including Olympia and Tiny Tim. It is great for us to be able to talk about horticulture at Paignton Zoo. We are a combined zoological and botanical garden, the plants are as important as the animals. This is a really good opportunity to remind people of that. The whole gardens team has worked hard on this and should be very proud of the results. The plant – from the rain forests of Sumatra and a member of the Arum family – is classed as Vulnerable on the IUCN Red List of Threatened Plants. It has one of the largest flowers in the world; the bloom – correctly, an inflorescence, is green on the outside and bright red inside, with ribbed sides and a frilled edge. Due to its odour, said to be like rotting meat, it’s known as a carrion flower, and has been dubbed corpse flower or corpse plant. It emits the strong smell at night to attract pollinators.